Fish Creek Moccasin Works is a small, family-owned business offering a diverse selection of fine handmade leather footwear and custom leather goods. 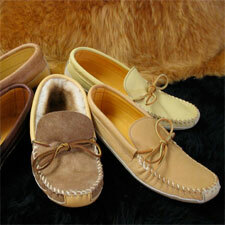 Founded more than twenty years ago in picturesque Fish Creek, Wisconsin by owners/leatherworkers Jim and Candy Yonker, Fish Creek Moccasin Works has developed a reputation for attention to detail, customer satisfaction, and high-quality leather footwear. Today, our business operates out of two locations in northern Door County, with the majority of the production taking place in the Bailey's Harbor store. Both seasonal visitors and local residents remember the rich smell of leather, the feel of uncut hides, and the sounds of the monstrous "clicker" thumping away in the back of the store. Since Fish Creek Moccasin Works first opened its doors, our customers have been able to observe the cutting, stitching, fitting, and lasting of the footwear being made for them. We offer a diverse line of moccasins including traditional canoe soles, crepe soles, slippers, and boots in all women's, children's and men's sizes. Our regularly stocked styles are offered in a wide range of leather including deer skin, elk hide, cow hide, pig skin, and sheep skin. We are also known for our skilled custom leatherwork with which we can accommodate unique and challenging foot shapes and sizes.